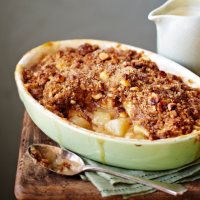 Think you can’t beat a traditional apple crumble? Think again – the secret is all in the fruit. Here eating apples stay chunky, British bramleys cook down to a fruity sauce and pears add an aromatic sweetness. 1. Preheat the oven to 160˚C, gas mark 3. Toss all the apples with the cornflour until it’s mostly absorbed, then place in a saucepan with the sugar, lemon juice and 200ml water. Cook for 5 minutes, until softened but not mushy, then turn off the heat, stir in the pears and lemon zest and tip into a baking dish (about 1-1.5 litres in volume). 2. For the topping, mix the flour, spices and oats in a bowl, then rub in the butter to a crumbly mixture. Stir in the sugars, hazelnuts and a pinch of salt, then scatter over the fruit. Sprinkle with a little extra demerara sugar and bake for 50-60 minutes, until golden. Swap the wholemeal flour for buckwheat flour and use gluten-free oats.